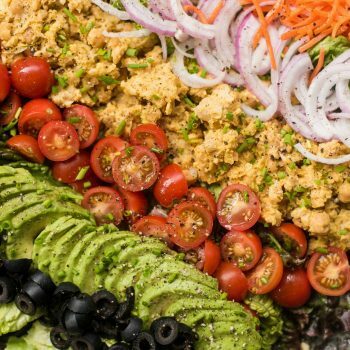 Entertaining Guests with a Vegan Cobb Salad is easy! 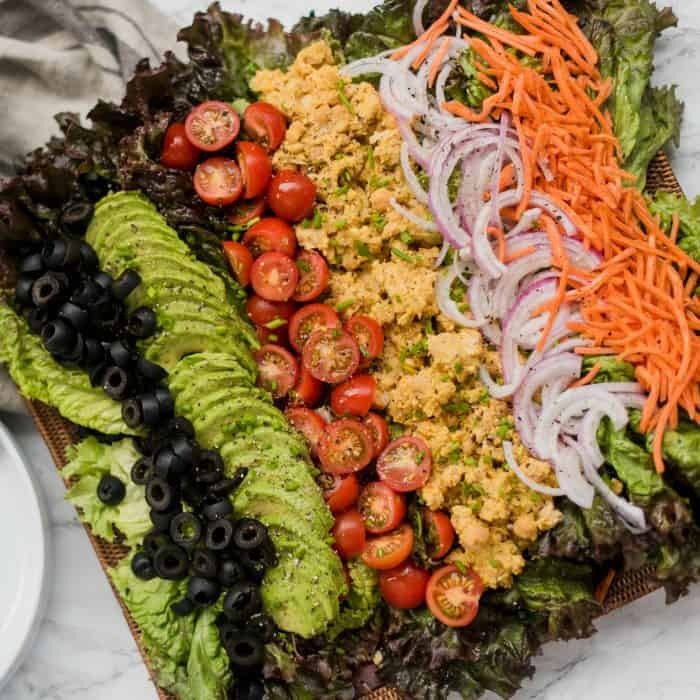 Enjoy this beautifully arranged Cobb Salad with tomatoes, olives, onions, chickpeas, avocados and more. Building friendships doesn’t have to be hard. It can be as easy inviting someone over for dinner. But what if they have a diet that is different than yours? 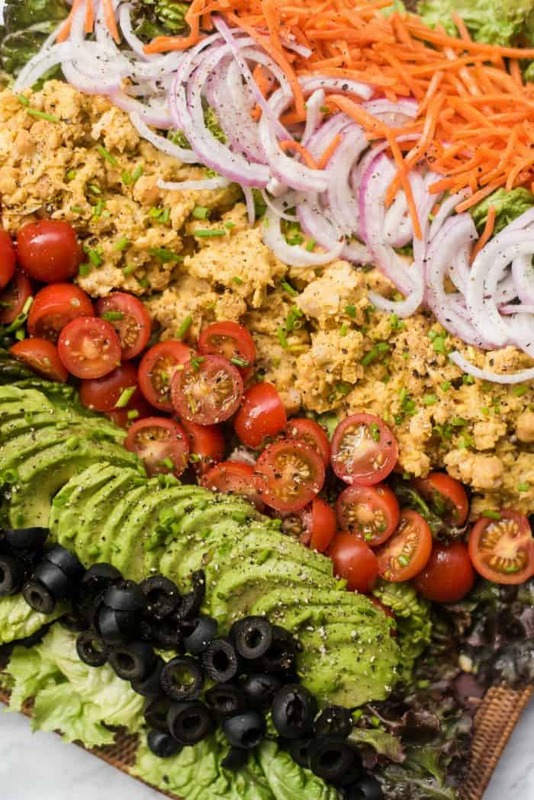 For one example, entertaining guests with a Vegan Cobb Salad is easy! I really appreciated them letting us know, because honestly, I don’t mind changing things up a bit with my menu planning! Usually I make worry-free stand-by recipes. But this time I went to the Kathy from HealthyHappy Life website and adapted her amazing salad recipe. I figured salad was safe, right? Especially in the summer months, everyone enjoys a salad. And the dressing with avocado oil and honey? Delish! 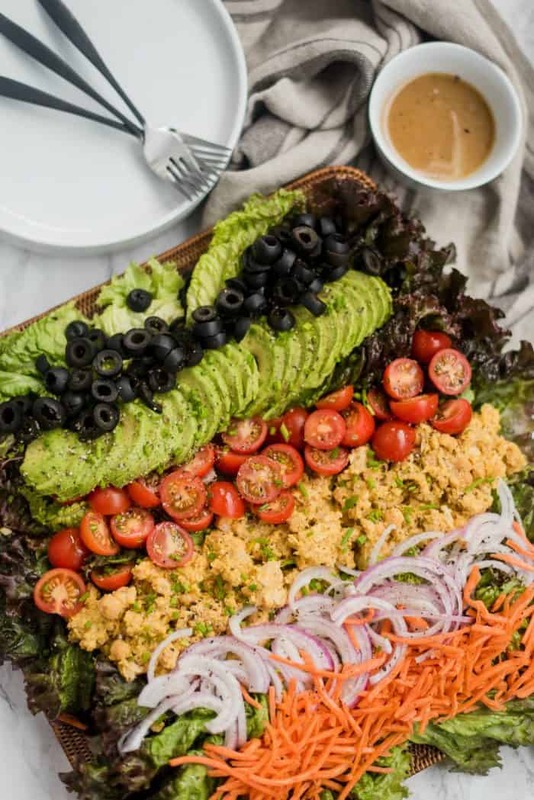 I love the chickpea “egg salad” in this dish, too. Serve in rows on a giant platter, a pretty presentation. One thing I’ve learned about vegans is they don’t expect you to come up with a brand new meal for them. They are usually good with salad, maybe a hummus appetizer, and even chips and guacamole. My experience is that, just like anyone else, vegans are just grateful to be invited over. A vegan diet centers on plant-based foods (eating more wholesome food), and cutting out animal products like diary, meat, eggs, and seafood. 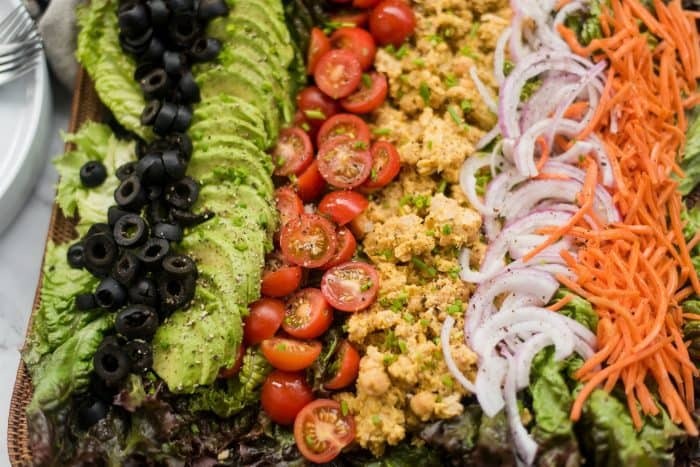 I like the idea of hosting a salad bar in general – where guests with varying diets can make their own salad! Cooking a different diet for guests might give you an initial “panic” but with the amazing Internet now, it’s so easy to find recipes! I asked on Facebook and received lots of replies and recommendations for sites/recipes from readers. So don’t let fear stop you. Try a new recipe, and it’s okay to let your guests know that it’s a “new one.” That maybe you’re out of your “cooking zone” but you were willing to give it a shot! Oh, and a quick 5-minute Vegan Coconut Dessert? So good, serve with a premium jelly or make your own compote! I’m glad our guests said yes to our invite. And I’m glad they let us know about their diet. And I love this new salad recipe and will make it again! In small bowl, whisk together all ingredients for dressing thoroughly—make sure the honey is fully dissolved. Set aside. In medium bowl, mash chickpeas roughly with fork. Add in veganaise, mustard, turmeric, and salt and pepper to taste. Continue to mash until ingredients are evenly dispersed. Set aside. 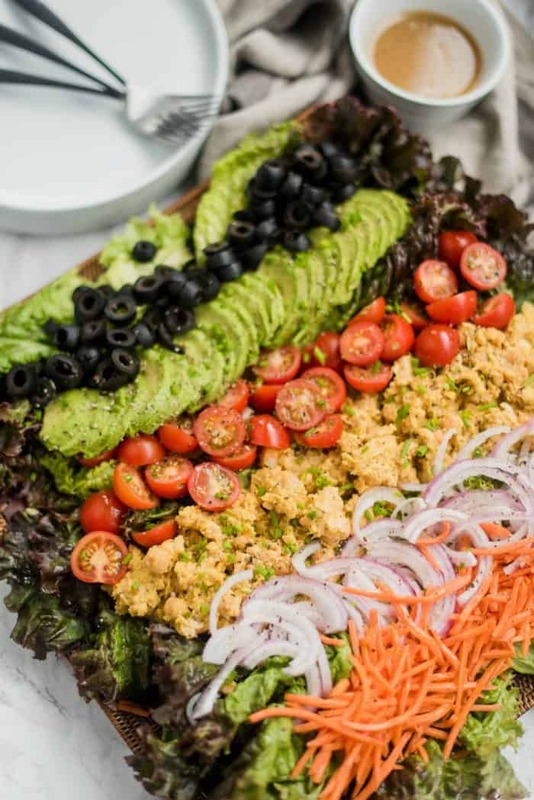 Chop and place veggies on top of lettuce leaves—along with chickpea “egg salad” and olives—as desired. Garnish with fresh pepper and chives. Enjoy with a drizzle of dressing! More Vegan recipes: Matcha Coconut Ice Cream [Lauren Kelly Nutrition], Vegan Potato Soup Recipe with Beans & Kale [Cookin Canuck], and Low-Sugar Flourless Vegan Apple Crisp [Kalyn’s Kitchen]. This post has been updated from 2013! Looks delicious! Thanks for the shout-out for my vegan apple crisp! 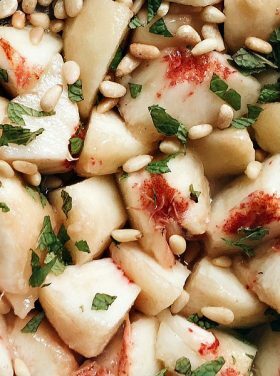 The hearts of palm are perfect in this. Love. 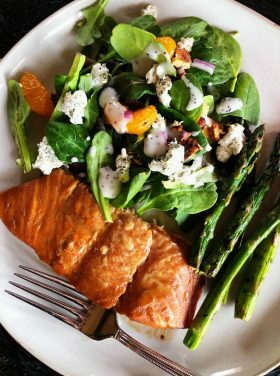 Mmmmm…I could eat this salad most any day of the week! I’ll be making that. Click. Print. We are not vegan but eat a handful of vegetarian & vegan meals ever week. I love exploring things in the kitchen these ways! What a beautiful salad. I can’t wait to make it and serve it. this is a great idea! who wouldn’t want this, vegan or not!? Agree, Lisa. It was fantastic. I had this very issue come up when we invited a new couple to our church staff over for dinner! Everything I could think of had cheese or eggs or meat in it! I eventually settled on a burrito bowl type of approach and made meat as one of the toppings. I’ll add this idea to my repertoire! This post is so helpful, Sandy! Thanks for another great post and a very practical suggestion to accommodate all kinds of eaters!! This is a great post Sandy. I did one awhile back (probably needs to be updated), but we have so many friends with dietary preferences or needs now that one can easily get intimidated. I just opted to jump in with both feet and learn new recipes. I’ve posted several on my blog. I’m so glad I did. This recipe sounds yummy. I’ve never had hearts of palm. What a delicious salad and it is always a great idea to be so considerate of your guests. Oh, you KNOW I have to love this recipe! Having been a vegan for several years now I always am so impressed by people who have us over as guests and prepare something for us well. Of course, I always offer to bring our own food – I think that should be expected of anyone with a special diet. But that said, when someone offers to fix something, it’s so nice. 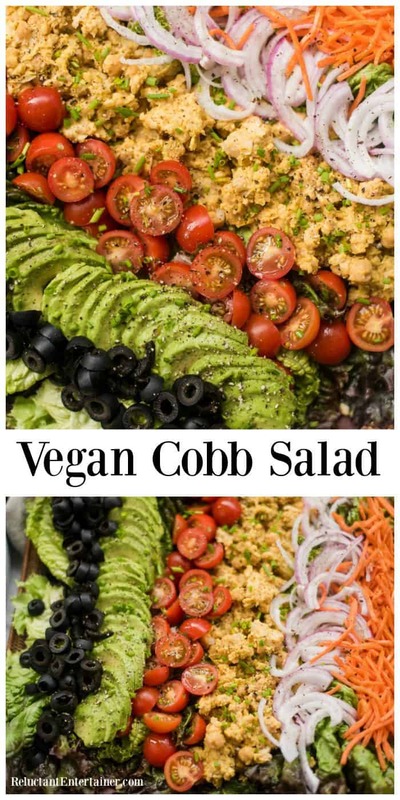 And if they served this salad? I would be in hog heaven! Can I say that as a vegan? You know what I mean! now THIS is my kind of salad, Sandy! having followed this style for years, I LOVE to entertain and show people how flavorful plant based can be! my “change” is often when I am cooking for meat eaters, either assigning Jason to cook/grill the meat, and or come up with creative dishes they will enjoy! I love this post!!!! 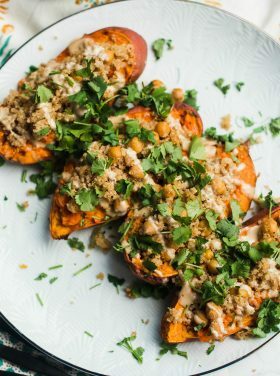 We love meat but we have also been eating more vegan, plant-based meals and it is astonishing how any delicious and easy ideas there are when you just get away from the “meat, starch, veg” concept of what a meal should be. Great post! We love meat, too, but we’re eating less of it (and less red, for sure). Thanks Liz!